I’m back!! Sorry for the longest delay to date but I promise I have lots of exciting (“exciting”) things to fill you in on-bear with me! I have been back in Uganda for 2 weeks as of today and I promise that I will have a recap for you all very soon. Look forward to a post full of power outages, broken machines and bullets (already told my parents so I feel like that’s okay to say now…). Maybe after you read it you’ll understand why it has been a little hectic here. My trip with my mom was absolutely amazing and I am so blessed that I was able to share this experience with her. Because she is so amazing she even wrote a recap of our trip together for me so I could remember all of the details. I’m not sure how but we managed to not take a single photo together the entire trip….there’s a first time for everything…..Below is an abridged version of Uganda through my mother’s eyes (don’t worry I cut out the embarrassing stuff). Thank you so much Mom! You being here meant more than you will ever know. I look at your blog daily and have noticed that it has been awhile since your last post. Now that I have seen you in action in Uganda, it is easy to see why this may not be your first priority. I have never considered myself a “helicopter” parent but I could not resist the temptation to jump in so that everyone would know about my amazing week in Uganda. I left what you call “the land of good coffee and reliable internet” voluntarily on a Sunday night with my colleague, Andrea. 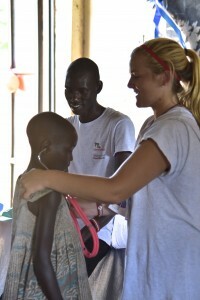 As most readers of the blog already know, Andrea is Amy’s mentor for her RHD projects in Uganda. As a mother I could not have picked a better mentor for my daughter. Andrea is the complete package: smart, energetic, and productive with a great personality and a sense of humor. She also has her priorities right – meaning her family always comes first. We arrived in Entebbe and were taken to the Case Western House in Kampala where I finally got to see you, my “Emmy”. It had been five months since I last saw you and I think this was the longest I have ever been apart from you but nonetheless you looked great and happy. After a quick dinner of beans and rice, it was bedtime since we had an early morning- we stayed up talking anyway…. Tuesday we woke up early and started the several hours long drive to Kasambya. Like all of our travels that week, we were in a van driven expertly by Picho. For this leg of the journey, there were eight of us in the van plus our luggage and supplies for the clinics- a little tight and definitely your father’s idea of a nightmare…. The purpose of the visit to Kasambya was to see if there were ways to identify more pregnant women with rheumatic heart disease and figure out ways to follow them up after delivery. Rheumatic heart disease is often not well tolerated in pregnancy and often the women will be sicker after delivery than they were pre-pregnancy. Each pregnancy brings more risk and this can be devastating in a country where most women have many pregnancies and birth control is the exception not the rule. It’s hard to believe that the burden of this disease remains so high in the developing world after we have seen it nearly eradicated in the US. At Kasambya, I was amazed at how easily you related to the people there. You met with the Village Health Team leaders to explain the purpose of the study. You treated everyone with respect and answered their questions thoroughly. I don’t have your way with words and am not sure I can accurately describe the clinic. I have been in a lot of rough and rudimentary places but this is one of the worst I have seen. The outhouses were concrete walls surrounding a hole in the ground mere feet from the clinic where women were in labor and delivering. They had no roofs and were frequented by all sorts of insects that I could not identify and I did not stay long enough to try. Birds that looked somewhat like a stork, appropriate I guess, were everywhere as were many other animals as the children ran around mostly barefoot- reminding me that improved living conditions and clean water is what is most needed in many places. We left the clinic and headed back to our two star hotel where we enjoyed dinner and attempted to sleep admist the birthday party that occurred into the wee hours of the morning. The next morning we finished up at Kasambya, once again loaded the van, and headed to Jinja. After arriving in Jinja and checking in we had a delightful dinner at the Jinja Sailing Club sitting next to the Nile. For this part of our journey we were joined by Rob from “Gift of Life” an organization that helps fund cardiac surgery teams to operate in many parts of the world that would otherwise not have access to open heart surgery. Along with Rob was Grace who is the head of the program here in Uganda. 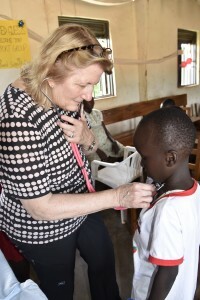 She is also the first patient that had surgery through the organization …..over 40 years ago. They traveled with us to Lira and Gulu- fortunately they had their own car……..the van was already a little tight. The next morning we headed to Nawanyago Health Center III to meet with the village health team there and to follow up some suspicious cases. I met Sister Angela and I agree with you that she is the sweetest Kenyan nun that ever lived although I must confess I have not met many. I got many hugs just for being your mother……….a little different than the reaction I got from the preschool or elementary teachers for being your mother……but I digress. One of the follow up studies that we did in Nawanyago was on a woman who was 20 weeks pregnant with her third child (having lost the first two). She had supposedly had surgery before for restrictive pericarditis- the same kind of surgery that Opio had. Unfortunately, when we looked it was clear that she had restrictive cardiomyopathy, which means that the muscle was affected. The only real treatment even in the US is a heart transplant- definitely not an option in Uganda. To make matters worse she was in an abnormal heart rhythm where the atria flutters making it even more difficult to get blood into the heart so that it can be pumped out. In the US we would have immediately arranged to shock her into a normal rhythm and given medicine to keep it there. Of course in Nawanyago, we had nothing. She had probably lost her first two pregnancies because of this disease and would likely lose this one and eventually her life because of it. The physician there also explained to me that she will likely lose her husband if she is unable to bear children. I have treated many patients that I could not help as a heart transplant physician but I don’t remember ever feeling quite so useless and powerless. I did get a chuckle from the Ugandan physician when I asked if we could cardiovert her…………….might be possible if we had the machine but then we would not have the medicine we needed to keep her in the right rhythm…………..perhaps all of the critics of the American health care system should do some traveling……..I am not saying that we don’t have some issues but I think we are pretty lucky ….anyways….. Finally, on to Gulu! The road was paved and therefore our journey was much shorter than the one you first had to make. There were many interesting things to see along the way. A Petrol truck had turned over and some how word spread and people were running and driving bodas in hoards to come steal the Petrol. The police were parked by the side of the road lazily watching…….We were even stopped on the way to be searched for guns………….luckily, I left mine home (just kidding for those that don’t know me, Amy knows I hate guns). When we arrived in Gulu , it rapidly became clear to me that this was indeed your home now. You knew everyone in town and when we toured the hospital, everyone knew you and respected you. The second day here was the most exciting as I watched support group #5 in action. The kids loved dancing around and learning about heart disease from you. I kept myself busy with my favorite activity…….taking pictures and making up for the restraint I hade shown at the other sites. You then gave them a chance to listen to their hearts and you even picked up an innocent venous hum on a sibling of a patient………..I have many residents that cannot do that and I would like to take credit but cannot- these are skills that you have clearly developed without my help! I also met Opio, his father and his uncle. They had brought his report card with them. We could not communicate very well but I could tell they were bursting with pride at what he had accomplished. Everyone at support group 5! I got to stay at the 31 Bits house where you are living and it was one of the highlights of my trip. I was not happy to see that you had a helmet since that could only mean you were taking bodas but at least you were protecting your head. Now that I have been there I understand why they are necessary to get around, but after your bus accident and seeing the driving in Uganda, there are some things that a mother just does not need to know……… Saturday night we had all (or most) of your friends over for pizza. This was definitely the highlight of my trip. In the US, there is a lot of talk about the entitled members of your generation. 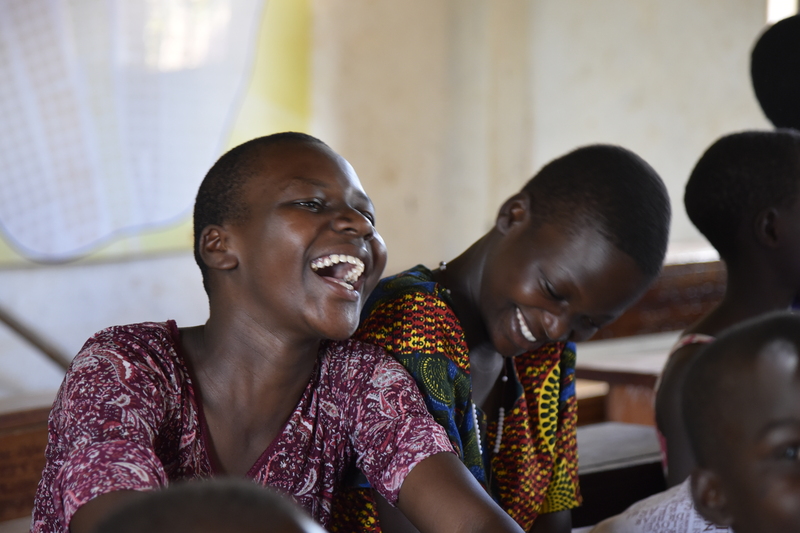 I would like to invite anyone who thinks that all young people feel entitled to spend some time with your friends in Uganda. They are an amazing group of people. First there are the ladies that work for 31 Bits. They are running a jewelry company that employs Ugandan women, many of which experienced firsthand the events of the LRA. Truly an amazing concept, as is the company being run by your friend Molly that refurbishes bikes to help Ugandans have a mode of transportation. Then there are your friends in the medical specialties, OB and emergency medicine to name two, that are spending significant time there trying to make a difference rather the usual 2-3 months. 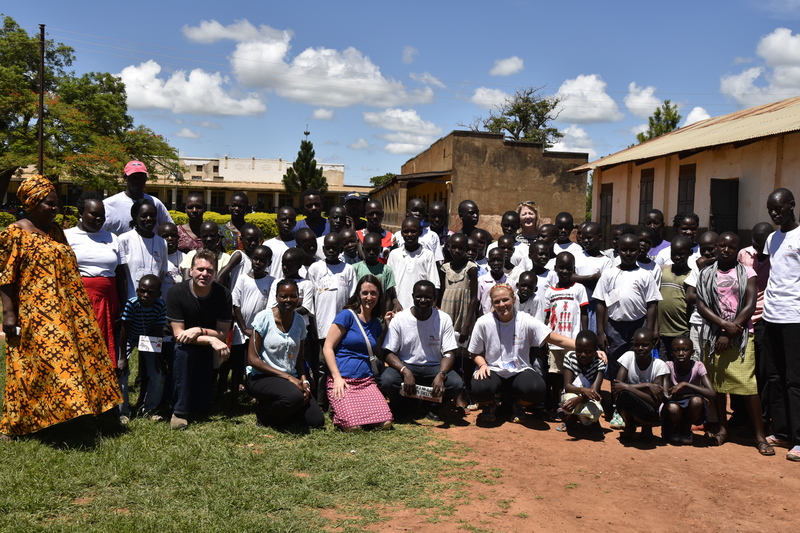 These are all young people giving their time and themselves to make Gulu, Uganda and the world a better place. It was a magical evening. Then began the long journey home. Fortunately you were coming with me so that you could attend Paul’s medical school graduation! I am sorry that I left you to go to business class but these old bones don’t do coach very well any more……. I did not see any elephants this time in Africa but there is still one elephant in the room. You continue to wait for that elusive med school acceptance……no matter what happens, just remember to follow your heart and never give up on your dreams. Dad and I just want you to find what you love doing for that is true success. We will always love you and we feel like the luckiest parents in the world to have you and Paul as our children.